The Godfather came from a Baton Rouge reptile show last year. We planned on including him in our reptile exhibit. As we expected, he is not only an awesome addition to our exhibit, but he’s quickly become a beloved member of the family. The Godfather has a unique, quirky personality and is very friendly – especially if you offer him a snack! Like alligators, tortoises are fascinating animals. Native to the Sahara Desert and the Sahel Grasslands, the Sulcata Tortoise, also known as the African Spurred Tortoise, is the third-largest species of tortoise in the world. The Sulcata Tortoise is also the largest mainland tortoise. They are herbivores with a diet consisting mostly of grasses and plants. If you ever have the opportunity to feed a Sulcata Tortoise, avoid feeding them fruit as it will make them very sick. Sulcata Tortoises are very friendly and have become popular pets over the years. 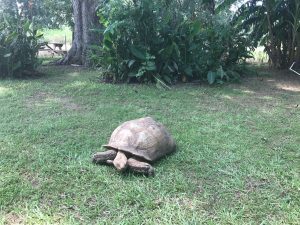 If you are entertaining the idea of getting a Sulcata Tortoise, brace yourself for commitment because these tortoises can live up to 150 years! In the wild, they dig large burrows in the ground to find areas with higher moisture levels. The tortoise then spends the warmest parts of the day hidden in these burrows. The Godfather only makes public appearances during the spring and summer months when the reptile exhibit sets up shop, so the next time you visit Alligator Alley, be sure to take the time to say hello to The Godfather!